Statis-Pro cards are organized for all 6 international all-star lineups and pitching staffs. Click here for pitchers, click here for batters, and finally click here for a google sheet all 2019 projected cards. Learn to play Statis-Pro Baseball in 5 minutes by clicking here. which includes a 2 part tutorial video (1st inning video and then 13 inning video) of how to play from an actual Dominican Republic vs. Puerto Rico game for 1st. Latest update: Canada vs. Venezuela - Jose Altuve led the powerful Venezuela team out of a slump with a 5 of 10 series that included a 2-run homer in the first game and 3-run homer in the second game against Canada. Vlad Guerrero homered again for the Canadians, but it wasn't enough as 2 their weak bullpen (the great Hanley Jansen is the only reliever better than a PB2-6) was exposed in 4-1 and 7-3 losses. Aroldis Chapman struck out all 3 Dominican Republic batters he faced to keep Cuba's losing margin to 5-1 (one short of the 5-run difference to give credit Cuba with a 1-2 record for that game. Unfortunately for Cuba their other there other 7 pitchers in 2 games struck out only 6 of Dominican Republic opponents in 2 games including a 12-4 second game win that does count as a sweep - giving the Dominican Republic a 5-1 record for the series to give them a 3 game lead over Canada-Netherlands for 1st place. Note: I provide these free instructions and cards to enable people to try out Statis-Pro baseball for free with dice, but my hope is you will see how revolutionary the game was an is and decide you want to purchase game parts and nice printed cards form those who make them (click here). You will see other links at the bottom of this post that make it easy to quickly learn to play the game before deciding if you want to purchase anything. 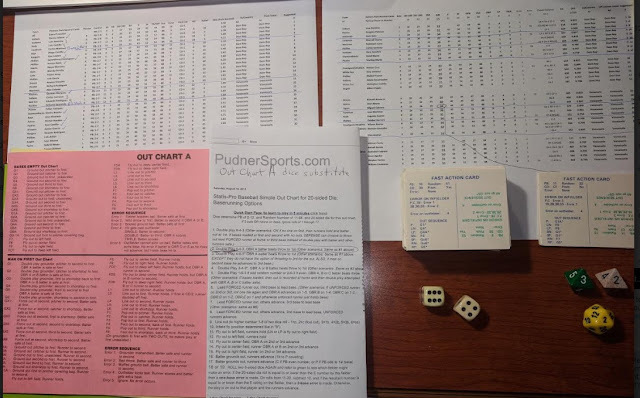 Results of games are below photo showing one way to set up the game, whether using dice and the Pudner Sports out chart or having the actual Statis Pro Out Chart A and Statis Pro Cards - while the sheets show all the playing "cards" for the Dominican Republic and Venezuelan pitchers on the left and batters on the right. (click here for all 2019 projected cards, with these 6 teams in order at the top). When Miguel Cabrera came up to face Danny Salazar, the result of the first card showed a PB 10, which would be the same as rolling 10 on the two dice as shown below. Because that result was outside the PB2-7 on Salazar's pitching card (See upper left-hand top name if you can stretch the photo out) the play was on Cabrera's hitting card. The next card show an Random Number (RN) of 32, which was a home run because it was lower than the large 34 (circled) number on Cabrera's line but higher than the number 26 before which would have meant a double. That number would be the same as if you were playing with two eight-sided dice and ended up with the blue 3 for thirty and lighter 2 for ones for a 32. If the result had instead been an OUT then the very bottom number on the first Fast Action card would indicate a grounder to third base (Cabrera is a righthanded power hitter so we look at the "RP" out which indicates G5 and you can read the pink chart to see that is a grounder to third. If you did not have a Statis-Pro out chart, you can use the alternate one showed, and roll the 20 sided die. We would have had the same result with a roll of "2" on the yellow 20-sided die shown which on the Pudner Sports outchart list is a grounder to third and would be a double play grounder if there was a runner on first with less than two outs. The Dominican Republic rallied after that home run to win the first game 4-2. This picture was actually taken after the first game with check marks by each pitcher for both teams that were used in that game as well as the four pitchers that are starters. We play all 2-game series and say each reliever can only be used in one of each two games, so the pitchers thrown in the first game were not available for the second game. Here are the results of each team's first game series and who started each game, followed by the pitching matchups for each team's second series and the "Pure ERA" we project for each starting pitcher - that being the ERA the pitcher would project to have next near if they played in a neutral ballpark with an average fielding team behind them. All 24 starting pitchers are referenced with the ERA we would project them to have next year if they pitched every game with an average ball park and defense behind him. Dominican Republic (Salazar 3.28 ERA) defeated Venezuela (3.05 ERA) 4-2 behind a single, double and triple by Ozuna and single and homer by Soto. Venezuela (Senzatela (3.84 ERA) defeated Dominican Republic (C. Martinez 4.21 ERA) 4-0 behind a homer, double and single by Acuna. Officially that makes both teams 3-3 since each team received credit for a 2-1 record for winning a game by 4 runs or fewer. Canada/Netherlands (Paxton 3.36 ERA) defeated Japan/Korea (Darvish 3.60 ERA) 11-2as potential Rookie of the Year Vlad Guerrero walked twice and then homered in the third inning to cap the scoring. We do throw in the Netherlands Antilles to give the Netherlands the reach of their old kingdom into the Caribean as well. Canada/Netherlands (Soroka 4.75 ERA) defeated Japan/Korea (Ohtani 3.68 ERA) 3-0 as the light hitting Japanese could not take advantage of Canada's number 4 pitcher before Jansen came in to close them down for the save and Gregorius provided all the offense with a solo and 2-run homer. Canada is credited for a 5-1 record for the two wins since one was considered a "sweep" due to winning the first game by at least 5 runs. Puerto Rico (Berrios ) defeated Cuba (Urias ) 5-3 as Correa and Hernandez hit first-inning homers to help start a 4-0 lead before Cuba stormed back by finishing the game 7 of their last 18 at bats and then Puig and Abreu hitting potential 3-run game winning homers foul as the last two batters of the game (which Clutch Batting - BD - comes up with men on base it can either be a run clearing double, triple, home run for foul home run). Cuba (Elias) defeated Puerto Rico (Cotton) 4-2 behind two Cespedes homers and Chapman 2.81 ERA) coming in after conservative doubles to strike out four batters. Both teams get credit for starting 3-3 for each winning a game by fewer than five runs. Japan/Korea (Tanaka 3.95 ERA and Hun-Jin Ryu 3.95 ERA) at The Dominican Republic (Severino 3.38 and L. Castillo 3.88)- Japan held on for 6-3 win despite allowing single, 2 doubles and pinch hit homer by Malkel Franco before Nelson Cruz grounder into game-ending double play with 2 on base. Franco started vs. lefty Ryu and hit 2 more homers in second game in 12-2, 17 hit route to get credit for 4-2 series win. Puerto Rico (J. Lopez 4.58 ERA Teheran 4.75 ERA) at Venezuela (Carrasco 3.16 ERA and E. Rodriguez 3.84 ERA) - Venezuela started the series with 6 hits in their first 10 at bats, but managed only one run in the two games against mediocre Puerto Rico to get stunned twice, 4-1 and 4-0. Rosario hit a 2-run homer in the first game, then Caratini in the second game and Correa singled past MLB teammate Altuve to drive in two runs and complete the scoring. Cuba (Urias 4.18 ERA and Elias 4.91 ERA) at Canada/Netherlands (Taillon 3.75 ERA and Pivetta 4.02 ERA) - Puig blasts 9th inning 3-run homer then Chapman shuts down Canada in order in bottom of 9th to give Cuba 4-2 win, but Simmons hits a 2-run homer in 8th to give Canada a 4-3 win in 2nd game to keep them in 1st at 8-4. Japan/Korea vs. Venezuela - Trailing 5-2 in the top of the 9th, the first 2 Japanese reached, resulting in Venezuela's virtually unhittable closer Felipe Vazquez coming in for the save. He induced a fly ball to center to retire Ichiro Suzuki, but Shohei Ohtani drew a walk to load the bases with one out. On a deep drive by South Korea's Jung Ho Kang centerfielder Odubel Herrera crashed into the wall and the ball bounded away in what became the first ever inside the park grandslam home run I ever had in Statis-Pro baseball play - not to mention it won the game 6-5. In the second game, Shin-Soo Choo hit two 2-run homers - one to start the scoring in the third and another to win it 5-4 in the 12th as Japan matched disappointing Venuezuela with a 7-11 mark. Canada vs. Venezuela - Jose Altuve led the powerful Venezuela team out of a slump with a 5 of 10 series that included a 2-run homer in the first game and 3-run homer in the second game against Canada. Vlad Guerrero homered again for the Canadians, but it wasn't enough as their weak bullpen (the great Hanley Jansen is the only reliever better than a PB2-6) was exposed in 4-1 and 7-3 losses to fall out of first place all season. Both the international league favorite Dominican Republic and Puertro Rico are in 1st at 7-5, so whoever wins that series will take sole position of first, or if they split then both will remain percentage points ahead of the Canada/Netherlands team.